The All Progressives Congress (APC) governorship candidate in Lagos state, Mr. Akinwunmi Ambode, has said that his robust experience in mainstream public service makes him well-positioned and most suitable to cater for the best interests of the civil servants in the state, when elected as the next Executive Governor. He said this today at an interactive session with Lagos civil servants, held at the Bero-Adeyemi Auditorium in Alausa. “I am proud to stand before you as one of yours and to assure you that this project before us is basically about you. I come with a promise to employ my experience in this noble profession, to serve your best interests as civil servants”. “This is a constituency I readily relate with, and with my vast know-how about the way things work here, I make bold to say that I am in the best position to cater for your interests, and thoughtfully admit your wishes and variant concerns”, assured Ambode. 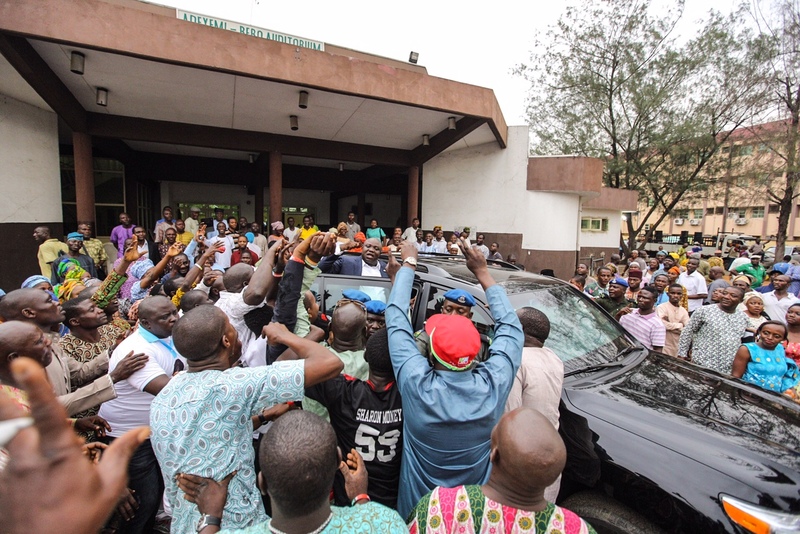 As the interaction got underway, Ambode entertained questions from the clearly elated and eager civil servants, after which he took time to enlist his plans and programmes designed to better the lives and expertise of the ones he described as “the workers who actually put their hands on deck in the process of making government work”. The questions bordered mainly around salary structure review, working standards, worker welfare, retirement benefits and some misgivings about bonuses and incentives. To all these, Mr. Ambode gave satiating, detailed and assured responses, a stance which confirmed that he truly understands their concerns by practical experience and not by mere imagination. As touching the echoed salary challenge, Ambode addressed the group by saying that it is also in the best interest of any sincere government to ensure that the salaries of her workers get commensurate with the integrity of each job designation. He therefore promised to consolidate on the ongoing productive negotiations the present administration is having with the Joint Negotiation Committee (JNC) on behalf of civil servants. He also cleared the air about his rumored singular role in the Leave bonuses situation by stating that, “no one can single-handedly make a decision as such. The movement from the harmonized salary structure to the consolidated one you have now, was informed by your very own calls to get a salary structure similar to the Federal model. The government back then in the year 2010 simply assuaged to your yearnings”. “I have always maintained that governance is about the people, and this leave bonus situation helps me drive home that point. Now that most of you want a reversal, we’ll definitely sit down again and review it together in favour of your best interests”, he added. Your leave bonuses have always been paid and will remain so. Beyond the salary scales and leave bonuses, he also assured that his administration will work assiduously to institutionalize capacity building, training and re-training programs for civil servants, in a bid to make them the best adapted to the best civil service practices, processes and procedures. “You are as competitive as what you make yourself. To this end, we are committed to bring skill-enhancing and mind-enriching capacity building workshops and training programs that will make you better individuals, who can actually thrive and remain active even after retirement; this is what our administration will offer you more than the salaries and bonuses”. He encouraged them to use his own civil service success story as a spring of inspiration to become the best civil service the nation can boast of. Ambode promised an increase in the number of incentives and performance-driven welfare packages for the workers, including loads of benefits, easier access to loans and scholarships, among others. He debunked rumours of neglect and unfriendly policies, saying that such rumours are totally unfounded, as he is competent-ready to lead the Lagosian civil servants to greatness and productivity. “There no such thing as neglect. I reckon that there’s nothing compared to a happy workforce, and being a God-fearing individual who is also a part of you, I know that if I don’t give you the best, God will ask me”, he said. 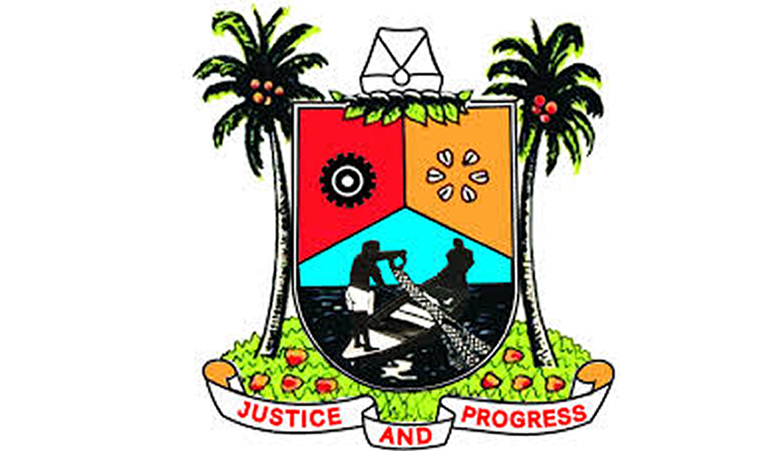 Complementarily, Ambode promised to hold interactive sessions with the civil servants on a quarterly basis, in order to constantly get feedback from them directly, and ensure maintenance of a working relationship. As regards the incoming general election, he urged them to become his fellow canvassers for continuity of excellence in the state and for Change at the centre, noting that more of the good they’d all love see will come as a result of such move. 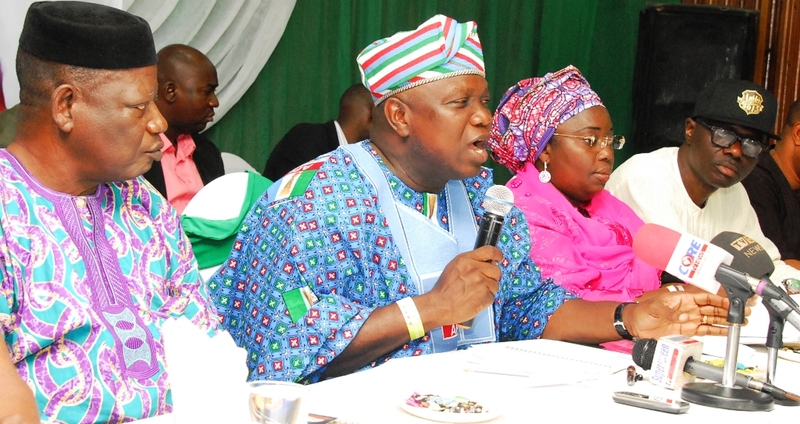 Ambode stressed, “This election is about your voting power, especially as a workforce. When you vote out this present incompetent government at the centre, you’d have succeeded in granting legitimacy and massive recognition to your voting power, such that, political office holders, myself inclusive, will know how removable we are when we represent non-performance”. The interactive session ended on a quite light note as the APC gubernatorial candidate enjoined the civil servants to see the interaction as a MOU of sort, where he is bound to fulfill all he had promised as much as they are also bound to vote for him. On behalf to the members, Comrade Akeem Kazeem of the Trade Union Congress, and Mr. Obafemi Oyelude fm the JNC, both appraised Ambode’s excellent disposition when it comes to engaging the people in productive talk, while appreciating his time with them. The members unanimously fanned support for his candidacy and favorited him as their incoming Governor, judging by the cheers and commendation given to the special Guest of the day. The All Progressives Congress (APC) gubernatorial candidate in Lagos state, Mr. Aknwunmi Ambode, has stated that he is totally committed to the prosperity of all workers in Lagos. He said this while speaking at an interactive session with members of the Lagos state chapter of the Nigerian Labour Congress (NLC) and Civil societies. “The primary responsibility of any government is the welfare of its people. The workers in this state make up over 60% of the people. One thing I assure you all is this, I am one of you and I remain committed to the prosperity of every worker in Lagos’, Ambode said. The event was organized with the sole aim of getting every Lagos worker well-posted with the specific plans of the APC governorship candidate for the workforce in the next four years. Ambode presented himself to the comrades as a candidate who sufficiently understands the workings of government, stating his readiness to employ that experience for the good of the state. The interactive session kicked off with questions basically centred on worker-welfare, even as they expressed other concerns regarding pensioners’ dues, taxing, job security, unemployment, the fear of job losses and the likelihood of unfavourable privatization of some government parastatals. In his response, Ambode restated that the aim of his government is to use a “combination of his experience and commitment to people-oriented leadership” to achieve further excellence in the state, thus, assuring that all the concerns raised were resolvable. “When I say I am committed to your welfare, I mean your prosperity, I mean your comfort, I mean fruitful negotiations, I mean better communication between the government and you the workforce, and I mean the prompt payment of your dues, workers and pensioners alike. I am one of you, and I know you are the ones who truly toil for the prosperity of our state, you deserve a rightful dose of such prosperity”, he said. Ambode added, “We will prioritize human capital development, such that the level of productivity within our labour force will rise considerably”. The APC governorship candidate underlined the essence of his integrity while sharing his plans as touching taxing. He stressed that his intention to run for the Lagos state top job is hinged on his strong belief in servant-leadership, not because he is an accountant; and so, he allayed fears high-handedness, stiff financial policies and high taxes, that were raised by a section of the audience. “It is on record that I was the only Accountant-General who made tax refunds to the people after investigations proved that they were overcharged. So, I promise ease, integrity and uniformity in the collection and appropriation of taxes. This project before us is about people-oriented service and leadership; I will not increase taxes, that I assure you”. The body of comrades saluted Ambode and his party,the APC, for being a party of true progressives and maintained that they also remain committed to the continuity of good governance and purposeful leadership in Lagos. They expressed solidarity with the Ambode project, while stating their resolve to remain partners in that progress. The state NLC Chairman, Comrade Idowu Adelakun, had earlier lauded Ambode’s antecedence and humility, stating that “this will be the first time a gubernatorial candidate will honour our invitation. Thank you Sir and I assure that we are with you in this quest for continuity and progress”. 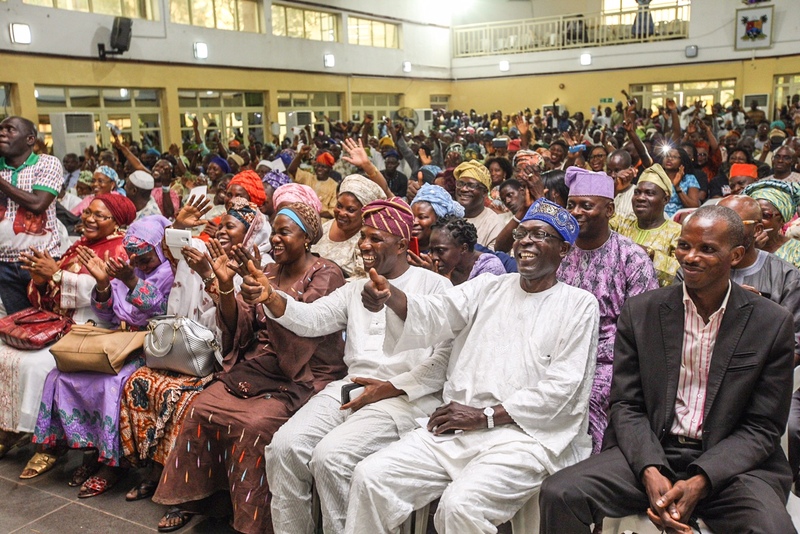 Ambode was at the labour chat together with his running mate, Dr. Oluranti Adebule. The labour and civil society groups represented at the event include Nigerian Union of Teachers (NUT), Nigerian Union of Journalists, Nigerian Association of Nurses and Midwives, Nigeria Union of Petroleum and Natural Gas Workers (NUPENG), Nigerian Union of Local Government Employees (NULGE), Senior Staff Association of Nigeria (SSANU), the Comrades Society Music, the Green White Green group, among others. The Lagos state All Progressives Congress (APC) governorship candidate, Mr. Akinwunmi Ambode, today held an interactive session with the State’s Council of Obas and Chiefs at the Banquet Hall of the Lagos State House. He shared his programmes for Lagos with them and sought their blessings. The session was chaired by His Royal Highness, the Oba of Lagos, Oba Rilwan Babatunde Osuolale Aremu Akiolu the First, and had all the Royal fathers present. 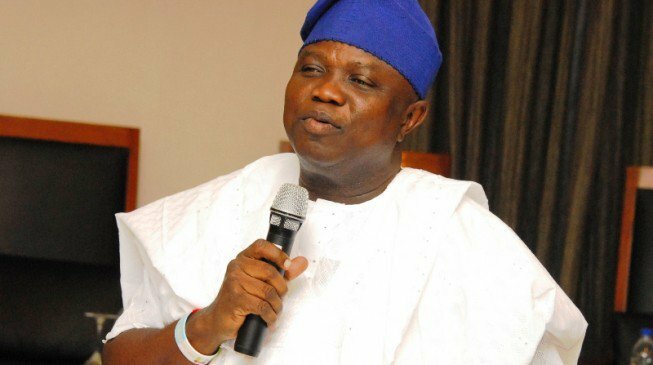 Ambode expressed his appreciation for the Obas’ presence at the meeting and he stated his resolve to work with them to take Lagos state to the next level. “I’m honored to be among you my Fathers. I am really grateful to you all for making this meeting happen. I am here to restate my sincere desire to keep serving this great state of ours and make it continue in that tradition of excellence it has been known with”. Ambode said. “I need the support and cooperation of you my Royal fathers to achieve this dream of getting a safer, more secure and more prosperous Lagos. I therefore further solicit your Royal blessings to ensure victory in the forthcoming February 28 gubernatorial election in Lagos. 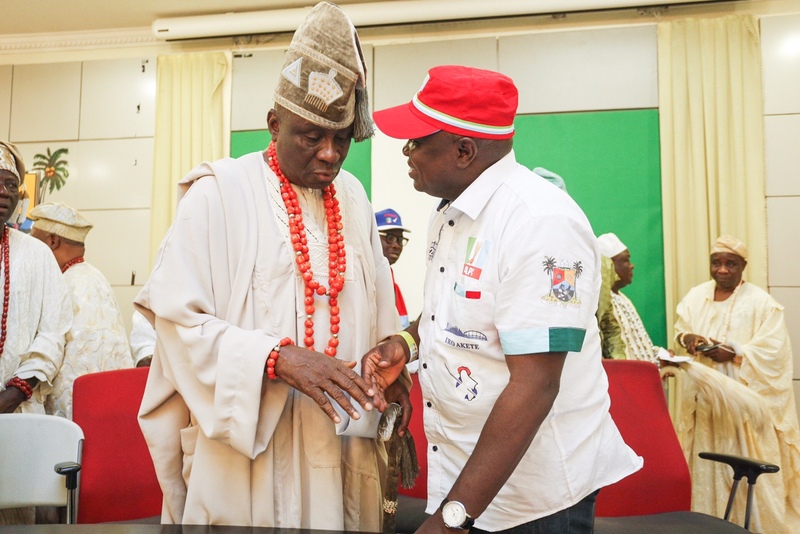 Speaking on behalf the Obas and Chiefs, Oba Rilwan Akiolu restated his support of Akinwunmi Ambode’s gubernatorial candidacy and he assured him of the support of all the Obas and Chiefs. In his words, Oba Akiolu said, “I have always maintained that the best is what I will support for Lagos. I assure all of you that Akin Ambode is the best candidate to succeed Governor Fashola and sustain our excellence in Lagos”. The Royal fathers were unanimous in their support of Ambode to become the next governor of the state, a move which the candidate expressed appreciation for. “I am so happy for your support my dear Royal fathers, I promise to uphold the prestige of our traditional institutions and also project the proud heritage of Lagos to the world”. Ambode stated. Present at the session were: The Olu of Ikeja, Oba Raufu Adeniyi Matemi Amore; Oba S. A. 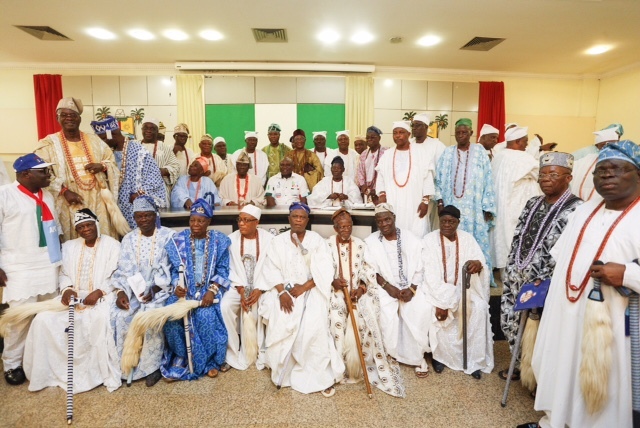 A. Oyefusi (Oguntade II) Ayangburen of Ikorodu; Oba A. O. Adesanya, Alara of Ilara; Oba Kamorudeen Animashaun, Oloja of Epe; Oba Lateef Atanda Adams, Olu Agege of Agege; Oba Fatai Ayinla Aileru, Olu of Mushin; Oba M. A. Ashafa, Onijanikin of Ijanikin; Oba Abideen Adekanbi Durosinmi, Osolu of Irewe; Oba S. O. A. Bamgbopa (Eshinlokun 1), Olu of Epe; Oba Saheed A. Elegushi (Kusenla III), Elegushi of Ikateland; Oba Wahab A. Balogun, Oba of Isheri-Olofin; Oba J. O. Fatola, Adeboruwa of Igbogbo; Oba Rafiu Olusegun Salami, Onibeju of Ibeju, among others. 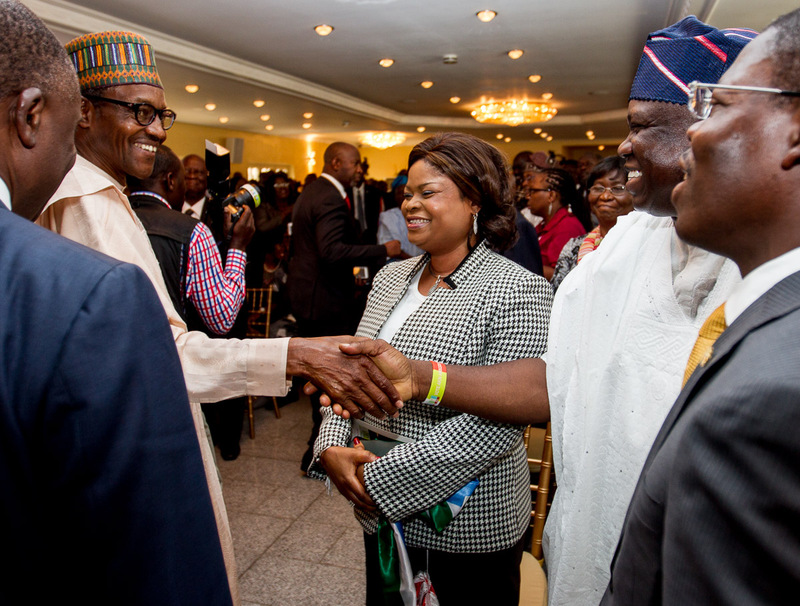 The All Progressives Congress (APC) governorship candidate, Akinwunmi Ambode, today was at the state house Marina, venue of an interactive session tagged “GMB Means Business”, where the APC Presidential candidate, General Muhammadu Buhari (Rtd), engaged members of the organized private sector. The theme of the session was “Mission to Rescue The Nigerian Economy”. General Buhari presented party’s people and research-based manifesto aimed at halting the downfall the Nigerian economy has suffered. He added that the APC’s message of Change is a positive one.